The Durability and the Service That Keep Industry Moving. We offer a comprehensive range of products to meet your specific off-highway needs. Genuine Spicer® off-highway driveshaft products are manufactured to the same high standards as original equipment (OE) parts. That is because they are OE parts. When an off-highway part is replaced with a genuine Spicer product, you will get the same performance and reliability that you have come to expect. Spicer® off-highway driveshafts and components consist of the most extensive line of products available, including driveshafts ranging in size from 400 Nm to more than 8,000,000 Nm for off-highway use in construction, agriculture, forestry, material handling, and mining. Our driveshafts are ideal for the rigorous demands of most mobile off-highway and industrial applications. Spicer Off-Highway Driveshaft Product Lines. Spicer 10 Series®: An industry standard for more than 50 years and ideal for the rigorous demands of most mobile off-highway applications, the Spicer 10 Series offers driveshafts with torque capacities up to 15,700 Nm. Larger capacities previously available in this series are now offered by Spicer Life Series® driveshafts. Spicer Life Series®: Offering features such as longer life, reduced maintenance and Quick Disconnect™ end yokes. Torque capacities range from 5,500 Nm to over 25,000 Nm. Spicer Compact 2000™: From the industry standard in Europe to the commercial vehicle market, the Spicer Compact Series offers a wide variety of end-fittings, from SAE to DIN and cross-serrated, allowing Spicer driveshafts to attach to nearly any axle or transmission. Torque capacities range from 2,400 to 35,000 Nm. 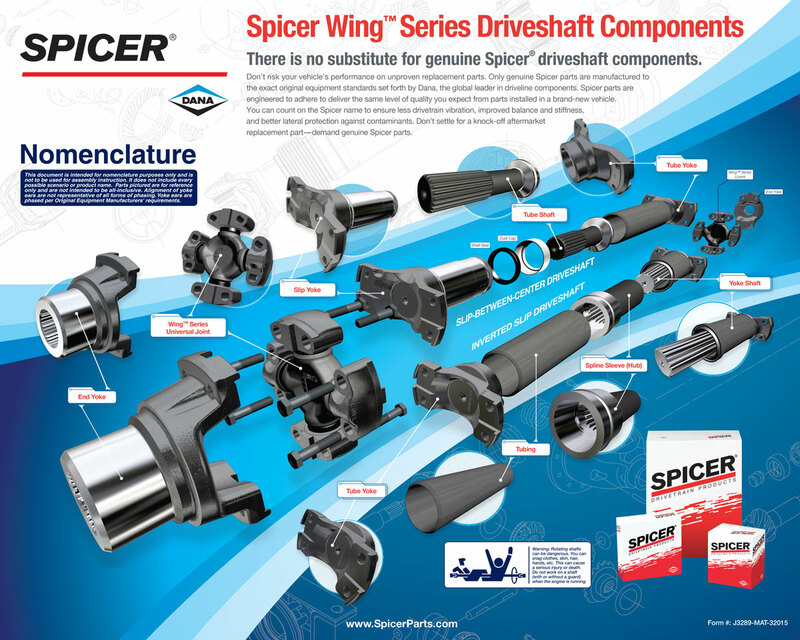 Spicer Wing Series®: Designed for longer life, minimal maintenance and lower operating cost—the most comprehensive range of wing-style driveshafts today. Torque capacities range from 1,500 to more than 120,000 Nm and lubrication packages range from extended to permanently lubricated. Spicer Off-Highway Parts: Powerful Innovations of All Sizes. Spicer off-highway parts include the world’s most powerful driveshaft-related innovations and the most extensive product offering, for everything from the smallest machines to the largest wheel loaders and mine haulers. With standard torque capacities ranging from 400 Nm to 1,750,000 Nm—and lubrication packages ranging from extended to permanently lubricated—Spicer has a driveshaft to fit your needs. Dana has a global network of trained professionals who have the knowledge and experience to service and repair your genuine Spicer parts. Get genuine Spicer quality for your commercial vehicles. Download the driveshaft assembly brochures above, and locate the Spicer Off-Highway Service Center nearest you today.